Want to increase note investing yields? 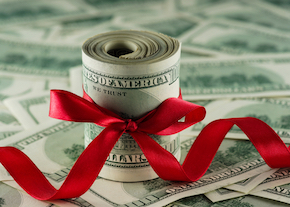 Discover ways to restructure a note for early payoff! When notes are purchased at a discount (less than face value) the yield is already higher than the face rate of the note. When you combine that with an accelerated return the discount is earned back faster making the yield go up. But enough about theory, lets take a look at the numbers. This example shows how to calculate the yield increase that comes from an early payoff on a discounted note. You can follow the example below or watch the video here. Solve for N – The remaining term is 240 months. Example: Invested $40,000 for 240 Note Payments. What Is The yield? Example: The $50,000 Note Pays Off In 5 years. What is the Amount Due? 50,000 8 418.22 60 ??? Example: Note Pays Off In 5 Years. What Is The Yield Now? The note investment yield went from an anticipated 11.20% to 13.86% with an accelerated payoff. This works so well there are times it even makes sense to offer the note payer a discount to encourage an early repayment. Other strategies include Cutting The Rate/Doubling The Payment and Early Payoffs With Incentive. Want more examples and step by step instructions? 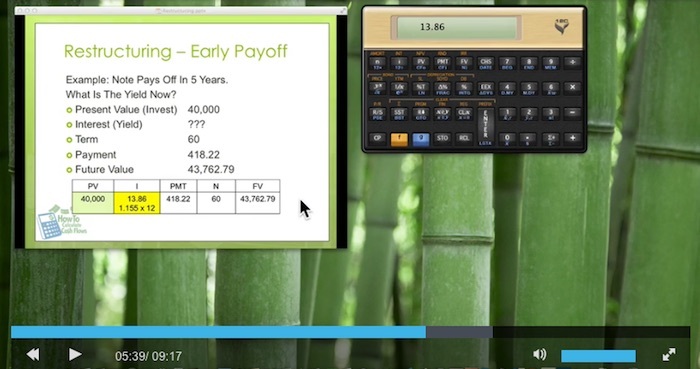 Access over 60 video lessons in the How To Calculate Cash Flows Online Training! great notes, and reinforces the validity of the HP12C. Are you aware of any excel-based spreadsheets or templates which perform the same function?